NOTICE: Activation key must be used on a valid Steam account, requires internet connection. ABOUT THE GAME	Cultures Bundle Cultures: Northland Cultures: 8th Wonder of the World NORTHLANDThe Vikings are back!Loki, known from the Nordic sagas as a versatile god of lies and weaver of many intrigues against his divine colleagues, has been banned from Asgard by Odin as a punishment for the t… rouble caused by the Midgard serpent. Now Loki is plotting revenge and searching for a possibility to sneak back into Asgard and pay Odin back. Out of spite, he abuses our four human heroes--Sigurd, the Frank, Hatschi, the brave Saracen, Bjami, and Crya--with his intrigues and traps. Embark on adventures and quests to help your allies wrest free from Loki's insidious machinations, whether it's a plague of serpents or the demon wolf Fenris dropping by for a rather unexpected visit. Ensure the health and safety of your people as you start with but a humble town and work your way up to a large city. 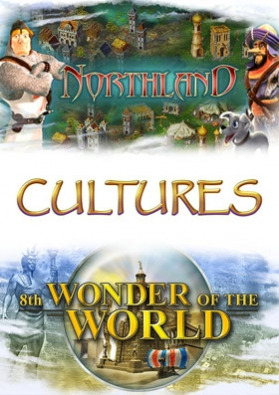 Cultures - Northland offers the best combination of strategy and adventure! 8TH WONDER OF THE WORLDCultures - 8th Wonder of the World takes place some years after the end of [i]Cultures - Northland[/i]. The renowned hero Bjarni and his friends, retired after their last adventure and enjoyed their day-to-day lives. This peace was not meant to last as one day the powers of darkness and evil slowly began spreading all over the world. The greatest heroes of the past were summoned. The people cried out to our friend Bjarni, who immediately set out to save mankind from the clutches of doom and misfortune once again. The destiny of Bjarni’s people, and with them the destiny of all humanity, now lies in your hands. You must solve the mystery surrounding the 8th Wonder of the World with your heroes and banish evil from the Earth! KEY FEATURES Three difficulty levels that make the game fun for anyone Explore unknown territories and establish trade routes with other tribes	Watch as your inexperienced fighters grow into fearless heroes of great renown Solve challenging quests and adventuresSYSTEM REQUIREMENTS Minimum: Windows XP / Vista / 7 / 8 1.4 GHz Processor (2 GHz recommended) 1 GB RAM (2 GB recommended) 3D graphics card compatible with DirectX 7 (compatible with DirectX 9 recommended) Mouse Keyboard © Copyright 2015 Daedalic Entertainment GmbH and Funatics Software. Daedalic and the Daedalic-Logo are trademarks of Daedalic Entertainment GmbH. All rights reserved.